Polka Dots and Feathers! 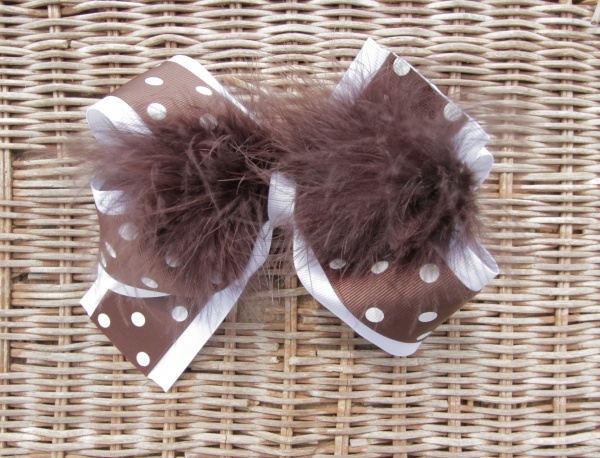 What a fantastic bow, this double layer is stuffed with an awesome chocolate brown feather boa. 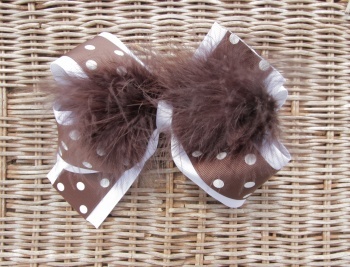 The bottom layer is a 2.25" white grosgrain ribbon with a 1.5" chocolate brown ribbon that has white polka dots all over. The center is wrapped with a white 3/8" grosgrain ribbon which keeps the boa in the middle and is attached to a French clip. Girls will love this combination and this extra flare of a feather!